A film taking a look into how mental health can affect someones life and those around them. But when you accept that everything doesn’t go to plan and start focusing on the silver lining of a situation you might just be able to turn your life around, that is something Pat is trying to do since returning home from a stint in a mental institution. I have heard that this film already has a lot of Oscar buzz surrounding it, having now seen it I can totally understand why that is. It has a very good mix of drama, romance, comedy with a brilliant cast who put in fantastic performances all whilst dealing with the difficult issue of mental health. Bradley Cooper was very impressive in this role, stepping out into an area we have not really seen him in before. Leading a film like this, we are used to seeing Cooper in comedies more as the side kick or part of a cast. But this film really pushing him to the limits and shows what a fantastic actor he really is. Jennifer Lawrence seems to be going from strength to strength with the different roles she has taken on so far in her acting career, she doesn’t seem scared to take on the roles which others may think twice about. In this film we follow Pat as he tries to adjust with life back at home with his parents. We slowly find out about what happened and how he ended up in the mental hospital and on medication for his condition. You probably would guess that it had something to do with a woman, his wife and an affair. When he returns home his father Pat senior who loves the Philadelphia Eagles football team is a bookie and see’s his son as the lucky charm for winning. So not only must he control his illness and wants to win his wife back who has a restraining order on him, he must not let his father down as the lucky charm! Everything changes when he meets Tiffany, who also struggles mentally as well as she is a young widow after her husband died. We find out that she has not had the best of times recently and Pat helps her out more than he realises. I liked that exercise was involved in trying to help them both out as they go out running and then the dance training they put in for the contest. I think it shows how much working out and being active with your body can help clear your mind (slightly) and give you goals to achieve. Robert De Niro is just brilliant in this film and shares some fantastic scenes with Bradley Cooper, who are totally believable as father and son. They really did click together just brilliantly and I think that is one of the major pluses about this film. Obviously Lawrence and Cooper together cancel each other out with amazing performances and it is hard to pick who outshone the other. I thought this film was so enjoyable as it had such a heart and romance as the key, even if you do not realise this until the very end. You cannot help but laugh throughout at the comedy parts, yet taking it so seriously at times as well. I think it really does have it all this film and I am sure it will be up there when the Academy Awards come around in 2013. It makes you think about the silver linings of situations in your life. 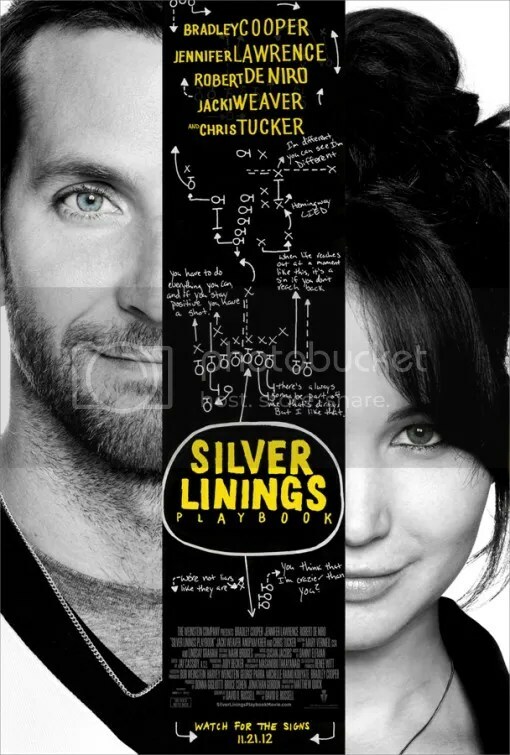 You cannot help but leave the cinema thinking that your life can always change and become better, you just have to search for the silver lining and never give up hope. Such a brilliant film to come out at the end of this year. I really would recommend it! Am I allowed to mention it in a similar mold to As Good As It Gets??? Why we must search for the Silver Lining! Good review Caz. One of my favorites of the year and just a movie that made me laugh, feel happy, feel a bit sad, thoughtful, and actually tear-up a bit by the end. Hopefully, I see a lot of this come Oscar time.